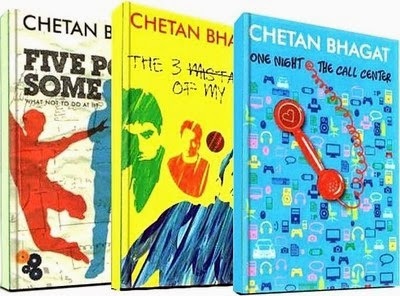 Chetan Bhagat Combo Of 3 Books is a set of three books written by Chetan Bhagat. The three titles are The 3 Mistakes Of My Life, Five Point Someone, and One Night @ The Call Center. The 3 Mistakes Of My Life is a story set in Ahmedabad. It is about 3 friends—Govind, Omi, and Ishaan—who join hands to start a business venture, a cricket shop. Govind is the central character and the narrator of the book. He aims to make a lot of money through their venture. Ishaan wants to nurture the talent of a cricketer named Ali. Omi just wants to enjoy the company of his friends. Their conflicting goals, amidst the backdrop of politics, religion, earthquakes, riots, and other problems, stand in the way of their success. The book was published in 2008. It received positive reviews and went on to become a bestseller. It has been translated into languages such as Hindi, Gujarati, and French. Kai Po Che!, a movie based on the book, is scheduled for a January 2013 release. One Night @ The Call Center is set in a call center called Connexions in Gurgaon, Haryana. It is the story of six employees of the call center who, when faced with several unpleasant occurrences, are forced to acknowledge certain negative aspects of their lives. The plot takes a dramatic turn when the six of them receive a phone call from God himself. The book, published in 2005, met with mainly negative reviews. Hello, a film based on the novel, was released in 2008. Five Point Someone, Bhagat’s debut novel, is set in the Indian Institute of Technology (IIT) Delhi. It is about three friends called Hari, Ryan, and Alok. The three of them get off to a bad start at the IIT when they mess up their very first class quiz. From that point onward, things go further downhill, and their efforts to make amends backfire. Eventually, they are stuck with a very low GPA, one that is sure to haunt them for the rest of their lives. Narrated by Hari, the story revolves around the trio’s attempts to beat the system and come out tops. Hari’s love affair with a girl called Neha is also central to the plot. The book was published in 2004. It inspired two movies - 3 Idiots (Hindi) and Nanban (Tamil).